2018 Updated Edition Available Now! The Harbinger by Jonathan Cahn, on the New York Times Bestseller list for an amazing 52 straight weeks, opened America's eyes to the incredible accuracy with which nine harbingers (prophetic signs) derived from the Isaiah 9:10 prophecy foretold the destruction of the World Trade Center towers on 9/11/2001, the economic collapse of 2008, and possibly the end of the U.S.A. as a sovereign nation in the near future. However, because Cahn failed to recognize the prophetic significance of an item that was discovered in the rubble of the North Tower of the World Trade Center on January 31, 2002, by the official New York Fire Department 9/11 photographer, Gary Marlon Suson, The Harbinger is incomplete. The Tenth Harbinger explains, based on thorough historical documentation and solid Scriptural support, how the item that has been overlooked by Cahn and virtually all other expositors of Bible prophecy links Isaiah 9:10 to hundreds of other verses of prophetic Scripture that reveal the exact identity and soon-coming, three-fold destiny of the U.S.A., plus what the Lord commands His people in America to do before the soon-coming holocaust occurs, and it is too late for them to be saved. 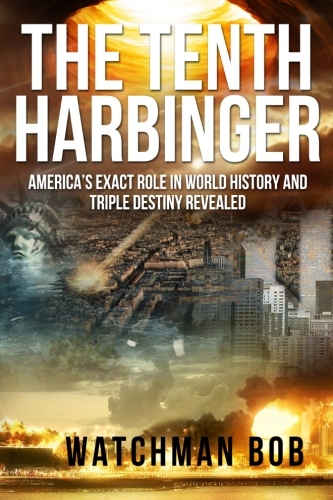 When The Tenth Harbinger was first published in 2013, it didn't seem that its basic message - America will be modern, prophesied Babylon the Great, the most economically, militarily and politically powerful nation on earth at the "the end of the age" - was feasible, because Barack Obama was President of the U.S., and his administration was weakening and attempting to socialize and globalize America in every way. However, now that Donald Trump is President, after just his first year in office and in spite of fierce opposition from the Left, the globalists, the mainstream media—practically the whole world—he is making astonishing strides in strengthening America’s economy, the military and border security, and economic and political ties with other nations, and apparently has the U.S.A. headed toward what he pledged at his inauguration - "greater than ever" (the most dominant superpower in the world). Therefore, The Tenth Harbinger has been updated to reflect current developments. Get the FREE 2018 PDF download, the 2018 Kindle e-book, or the 2018 hard copy from Amazon NOW, and understand exactly what is happening and will soon happen in America according to Bible prophecy and what you need to to about it, before it is too late. It is not the purpose of this ministry to profit from the sale of the Truth. Our whole purpose is simply to get God's sure Word of prophecy concerning the identity and destiny of the United States of America, and what He commands His people to do about it, into as many hands as possible . . . before it is too late. Therefore, we are making the contents of the book available in one format absolutely FREE, and in two other formats at very nominal costs that barely cover the cost of manufacturing and distributing the book. Download the pdf version of The Tenth Harbinger for FREE. This pdf version is in a 176-page, 8.5x11 notebook-size format for printing out on 2-sided pages with large enough inside margins for punching 3-ring binder holes (or for reading from your computer monitor and sharing with others via email attachments). Left-click to open or right-click to download this PDF file here. Purchase the 2018 updated Kindle version of the e-book through Amazon. The e-book version is $2.95. Click HERE to access the Amazon Kindle listing. The published, mail-order version of The Tenth Harbinger is 222 6x9 pages with a laminated paperback cover as shown below. The price, plus shipping, of this bound, paperback version is just $8.78 U.S. (the minimum required to manufacture and distribute the book). Click on the image below to access the Amazon listing. We operate on a very limited budget, which limits our time in maintaining this site, responding to comments, questions and requests, and getting out the warning about the soon-coming holocaust. Please help support this watchmen's ministry by donating as the Lord leads, before it is too late.